Amos Alonzo Stagg and Henry L. Williams. 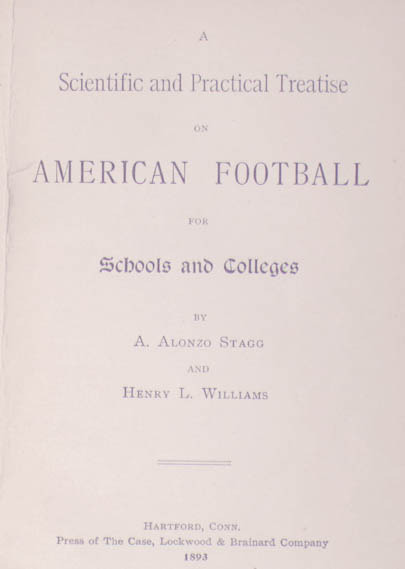 A Scientific and Practical Treatise on American Football for Schools and Colleges. Hartford, Conn.: Press of the Case, Lockwood & Brainard Co., 1893. Autographed copy. Gift of Edward R. "Butch" Slaughter, admired coach and "father of intramurals" at UVa. The legendary Mr. Stagg was one of the great innovators and motivating forces in the early development of the game of football.